To some, the Fall means the end of summertime, but for others, it’s just the beginning of crinkling leaves lining the sidewalks, comfy sweaters, and anticipation for the city to be covered in a blanket of white snow. Oh yes, I forgot one thing: fall means Pumpkin Spice Lattes. Now though, it seems that everything has the common “pumpkin-spice” phenomenon- Starbucks, Dunkin' Donuts, McDonalds, pumpkin pie creamer on commercials, pumpkin bagels at Bruegger's, pumpkin bars at the dining halls… pumpkin spice everywhere. Even David’s Tea in the South End now sells a Pumpkin Chai tea for the season (which, I will admit, smells awesome). I do appreciate a little pumpkin spice here and there, as we all do. However, sometimes a little deviation from the norm is the perfect thing to pick you up from your “it’s almost winter” gloom. That thing is the perfect hot chocolate. You might be thinking that Max Brenner is the hot spot for all things chocolate, and you may be right, but there is another place you need to get to NOW (before you’re too cold to take the trek down Newbury Street). I wasn’t exactly in the mood for hot chocolate when my friend dragged me to L.A. Burdick to try some. 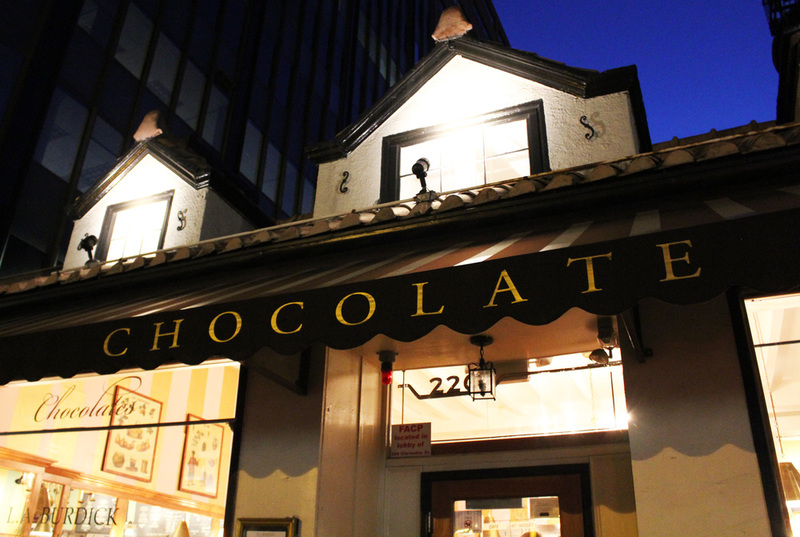 I’m not a big sweets fan, so I walked there expecting the usual hot cocoa. For me, that consists of a watery mess with too much sugar, not enough “cocoa,” and coming straight from an artificial mix. Sipping down dessert just doesn’t appeal to me, but this place completely proved me wrong. Before you even walk in to L.A. Burdick, you already know you’re in for some glorious treat because of the giant sign adorning the front that simply says “CHOCOLATE.” You walk into this small café and see chocolate lining the shelves, smell its sweetness, and glance at a delicious chocolate menu. Now, they may have pumpkin spice lattes, macarons, and cakes but you cannot leave this place without having a cup of their white, milk, or dark hot chocolate. At first, the barista handed me a tiny cup and I felt almost betrayed that I did not have enough to last me the entire walk home to campus. Oh boy, was I wrong. This smooth milk hot chocolate was rich, creamy, not too hot, and not too sweet. It had a velvety texture, like mixing melted chocolate with just the right amount of milk to make it the perfect balance of lightness and decadence. The best part about this warm drink was its ability to make me forget the slight chill in the air and focus on every single sip. I will admit that I could not finish the whole cup, but every taste I took was absolutely delicious. It really shows what alternatives like Swiss Miss and Starbucks have been concealing from us for so long. So, for the cold days to come, drag a friend, take the trip to Newbury, pass by every Starbucks, stop in to L.A. Burdick, and leave your pumpkin spice for another day. Trust me, you’ll be hooked.